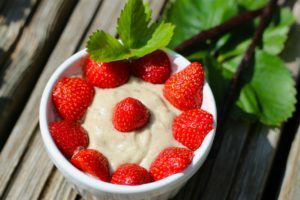 This my friends is one of those exciting recipes that makes following a grain-free diet so much easier. Anything bread-like seems to be a thing of the past if you follow a paleo, AIP or any other grain-free diet. But it doesn’t have to be that way. 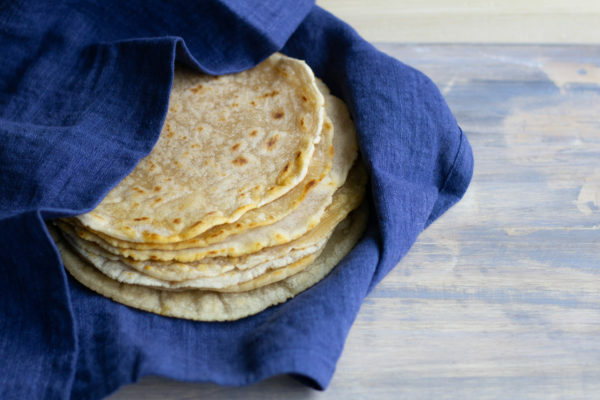 This grain-free roti recipe is the perfect life saver. It is easy to make and only requires 4 ingredients. When my husband introduced me to roti rolls I was instantly hooked. It quickly became our weekend take-out staple. After being grain-free for over 3 years now I started missing roti rolls and decided to try my luck using cassava flour. Cassava is a naturally grain, gluten and nut-free root and therefore great for baking for people with food restrictions. When it comes to grain-free flours it is the most similar to wheat flour and therefore much easier to use than other flours. You can stuff your roti with your favorite ingredients. I love my roti rolls best with aloo gobi. You can find the recipe for the aloo gobi roti roll here. To make your life a bit easier double up the portion of this recipe and save some rotis in your fridge wrapped in the kitchen towel. To warm them up simply add a bit of water on both sides and warm them up in the pan until they are soft again. Are you excited about this but still miss other breads as well? 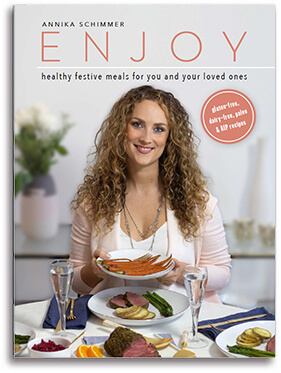 Make sure to get my latest book “ENJOY” featuring grain-free biscuits and a hearty 5 seed bread. Do you miss breads on a grain-free diet? This roti will be your new best friends. It is gluten-free, dairy-free, paleo and AIP friendly. Make 6-7 small balls. This might vary depending on how big you want your roti to be. The bigger the roti the easier it is to wrap it but it becomes a bit harder to handle when making it. Roll out one of the balls between 2 layers of parchment paper using a rolling pin. Roll out to your desired thickness. I recommend the thickness you can see in the picture. Preheat a large pan over medium heat. Once hot add enough avocado oil to coat the pan. Remove the top layer of parchment paper. Place the roti on your palm with the parchment paper side up and carefully peel off the paper. Place the roti into the hot pan and fry until small bubbles form. Flip and finish on the other side until slightly browned. It should take about 3 minutes per roti. If the pan gets too hot reduce the temperature to medium low. The longer you fry it the harder/crispier the roti gets so keep that in mind when deciding how long to fry it. Place the roti on a plate with a fresh kitchen towel and wrap it with the towel to keep it hot. Repeat all steps for the rest of the rotis. Use 2 frying pans to speed up the process. Hi Judy. I am not sure. I have never tried that. If you want to give it a try I would only try it with 1/4 of the amount of the ingredients to not waste much if it doesn’t turn out good.